SACRAMENTO, CA [August 28, 2018]— It’s a well-kept secret that parts of California rival the Northeast for leaf peeping in the autumn months, with fiery colors ranging from deep red, to orange, to gold and yellow. The California Association of Boutique & Breakfast Inns (CABBI) has compiled a list of some of the best inns for exploring that state’s fall color. The aspen trees in California’s High Sierra put on a spectacular show in the fall, turning shades of yellow and gold. One of the best places to view the show is along Highway 88 between Silver Lake and Hope Valley. The aspen leaves begin turning in late September and typically continue through the end of October. Kit Carson Lodge at Silver Lake provides a perfect jumping off place for viewing the fall colors. Blending elegance with rustic beauty, the historic resort features a gourmet restaurant, art gallery and boat rentals for skimming across the lake rimmed by a blaze of colors. Just south of Lake Tahoe in Hope Valley, Sorensen's Resort is nestled on 165 acres of pine and aspen forest and offers a multitude of outdoor pursuits. Guests can take in the golden leaves and crisp blue skies while fishing, hiking, bicycling or just lounging in a hammock. The resort features cozy cottages and log cabins with wood-burning fireplaces and kitchens; some of cabins are pet-friendly. The resort also offers a traditional wood-fired sauna and a full service restaurant serving its signature cool-weather dish: beef burgundy stew. In the charming mountain town of Truckee, the Donner Lake Inn is nestled among over an acre of pine, maple and aspen trees, providing spectacular fall color early in the season. As the temperatures begin to drop mid-September, the fall colors emerge. Each guest room offers forest views from window benches or a deck overlooking the trees, with fireplaces to enhance the ambience of the season. The inn serves hot spiced apple cider and homemade pumpkin spice cookies or breads each afternoon, and there’s an outdoor hot tub open year-round for soaking up the forest views. 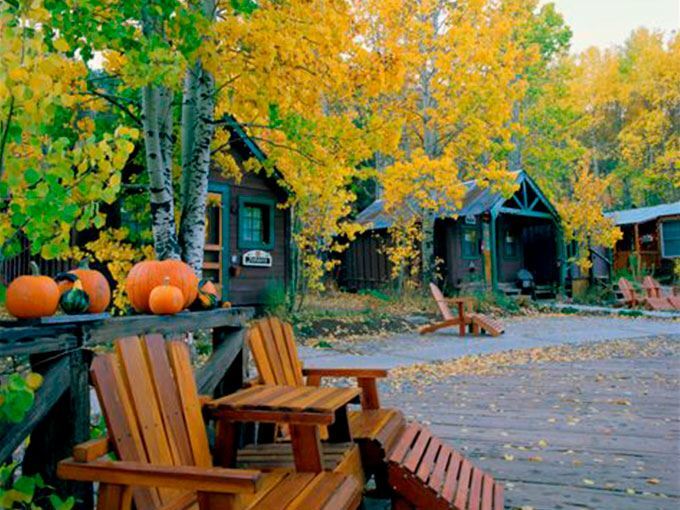 Fall in California’s Gold Country doesn’t get any better than at Eden Vale Inn. Indian summers bring pleasant temperatures and autumn’s colors and golden light are on full display amid the inn’s acres of gardens. The foliage in the area begins to turn in October and peaks within the first three weeks of November. The inn features hammocks for lounging beneath the trees, private outdoor soaking tubs for two, and an outdoor fire pit for enjoying the changing season with s’mores and a glass of wine. The nearby Apple Hill harvest festival runs daily through Thanksgiving and is a great place to pick up a pumpkin or crate of apples. In autumn, the college town of Chico is ablaze with a spectrum of fiery colors: deep reds, oranges, gold and yellow. At Bidwell Park, which is one of the largest urban parks in the U.S., visitors can hike or bike among the 3,600 acres of oaks and sycamore trees. You can also stroll along Chico’s many tree-lined streets to take in the autumnal colors while fallen leaves crunch underfoot. The leaves typically begin turning in October and peak in early-to-mid-November. In the heart of downtown near Bidwell Park, the Goodman House Bed & Breakfast is a stately 1906 Colonial Revival with antique furnishings, irresistibly comfortable beds, and private baths, some of which have clawfoot tubs. Napa is the best place to find fall colors close to the Bay Area. Napa’s mild climate delays the changing colors of the trees until late October and November, but it pairs well with clusters of ripened grapes and the crimson and gold grape leaves, which turn at the same time. Built in the late 1940's on the grounds of an apple orchard, the Stahlecker House in Napa beckons guests with fall color and quiet country sounds of crickets and birds. Secluded on one-and-a-half acres of lush lawns, flowering gardens, fountains, mature trees, and a running creek, the inn provides the perfect ambiance for a relaxing, romantic stay. The inn is located just minutes from the gateway to over 400 wineries, live music, live theater, and a myriad of events celebrating Napa’s wine harvest and crush season. In Napa’s northernmost town of Calistoga, Mount View Hotel & Spa provides a front-row ticket to Napa Valley’s annual harvest celebrations and fall color. Harvest parties, grape stomps, private winery tours, and farm-to-table dinners fill the calendar as the region’s lush green vines morph orange and copper and local wineries work around the clock to bottle wines in equally gorgeous colors. The Silverado Trail is a favorite way to take in the changing of the leaves and visit wineries along the way. To see more trees in their autumn regalia, guests can head to Bothe-Napa Valley State Park, where black oaks and big-leaf maples form a colorful canopy over the year-round creek. For more information on these and other California inns, visit www.cabbi.com.